On October 22, 2010, the outgoing director of the New York office of the U.N. Relief and Works Agency for Palestine Refugees (UNRWA), Andrew Whitley, stunned his listeners at a Washington conference by arguing that "the right of return is unlikely to be exercised to the territory of Israel to any significant or meaningful extent," and that UNRWA should help resettle the refugees rather than perpetuate their refugee status. Confronted with a barrage of criticism from the Palestinian Authority and many Arab states, Whitley quickly backed down, claiming, "It is definitely not my belief that the refugees should give up on their basic rights, including the right of return." Middle East analyst Daniel Pipes commented: "That UNRWA might contemplate going out of business and helping end the Arab-Israeli conflict … was too good to be true." Indeed it was, especially when taking into account that UNRWA was established more than sixty years ago on December 8, 1949, as a temporary humanitarian organization: "To carry out in collaboration with local governments the direct relief and works programs" and to "consult with the interested Near Eastern governments concerning measures to be taken by them preparatory to the time when international assistance for relief and works projects is no longer available." 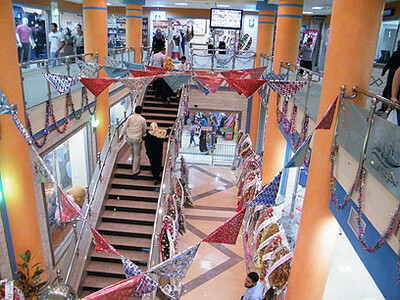 A Gaza mall bustles in July 2010. On November 11, 2010, Ging complained of persistent supply problems attending the Israeli blockade. Yet two weeks later, he rebutted this assertion, as well as the claim by UNRWA's commissioner-general Filippo Grandi that Israel had not allowed the entry of a single truckload of construction materials, by acknowledging that "the shops were full of consumer goods." With the passage of time, this modest, transient outfit has evolved into a permanent feature of the Middle Eastern sociopolitical landscape with tentacles spreading well beyond its originally mandated relief operations to virtually all walks of Palestinian life from education, to health, to community-based services, to the Palestinian-Israeli conflict. The propensity for senior UNRWA staff to make inappropriate, incendiary, and highly politicized statements—in stark contrast to the organization's mandate—has long been documented by the Jerusalem-based Center for Near East Policy Research. The case made by UNRWA staff, that such statements are a necessary element of protecting the Palestinian refugees, can be seen to be without justification: Nowhere is "protection" in the political sense part of the UNRWA mandate; UNRWA was originally charged with providing direct relief and work programs, and this was later expanded to include education. Moreover, even if political protection had been mandated, it would not warrant misrepresentations of fact, let alone incitement. This document tracks that trend during the course of 2010 with a special emphasis on the agency's statements concerning the Gaza situation with the author's rebuttals in italics. The announcement [regarding Israeli intentions in Operation Cast Lead] was that this whole war was about demolishing the infrastructure of terrorism. But we look around and see that this was not the case. The infrastructures of the economy and education were destroyed. And the infrastructure of the government—ministries and the president's compound. These are not the infrastructures of terror, these are the infrastructures of peace—the infrastructures of a state … the parliament building, the infrastructure of democracy. This protestation of innocence is highly disingenuous for it is inconceivable that Ging was unaware of Hamas's propensity for operating from within civilian infrastructure, housing terrorists and weapons in private homes and public buildings (mosques, hospitals, schools, etc. ), and using such sites for rocket and missile attacks. By alluding to the parliament building—used by the Hamas terror group, the governing entity of Gaza—as an "infrastructure of democracy," Ging willfully distorted the oppressive reality in the strip. If you have no reason to live, you will seek a glorious death. It's worse now than it ever was before. A whole generation of Palestinians will have never got out of the besieged strip, never interacted with foreigners, or even met Israelis except as enemy soldiers intent on killing and destruction. Their violent behavior and disrespect to their parents is symptomatic of the desperation they are growing up in. There is a distance between the mischaracterization of Gaza, as a so-called "hostile entity," and the scale of the civility of the people who populate the Gaza Strip in these very uncivilized circumstances. They are very civilized people who manifest very clearly interact[ion] with visitors. The denial of Gaza's position as a "hostile entity" is a highly politicized and totally false statement. When thousands of rockets have been fired from the strip at Israeli population centers for nearly a decade, and its governing party Hamas is openly sworn to Israel's destruction, Gaza cannot but be considered a hostile entity by any political, legal, or moral criterion. Ging implies that the Gaza residents are devoid of associations with Hamas—which he never mentioned—and totally innocent bystanders. All [UNRWA] teaching staff is closely vetted by the U.N. in order to provide a non-political education. This is perhaps Ging's most outrageous misrepresentation of the facts at this press conference. The reality is that Hamas, via its affiliate Islamic Bloc, has dominated the UNRWA teachers' union in Gaza for fifteen years, and, in 2006, gained full control of the union's executive council. Hamas enormously influences the education in the classroom. Therefore we ask the international community: Bring us the supplies we need to rebuild schools and run them; bring us the supplies we need [for] hospitals and medical centers. Everybody knows how desperate the situation [in the Gaza Strip] is after almost three years of blockade. We need action now. And who would stop the ship with such things as teaching materials and materials to [build] schools? In that case, we would get a new reality for the international community. Then the purpose of the blockade would be to destroy Gaza, not to protect Israel. We believe that Israel will not intercept these vessels because the sea is open, and human rights organizations have been successful in similar, previous operations proving that breaking the siege of Gaza is possible. Where there is a political will, there is always a way. The blatant incitement for action against Israel, hardly a part of UNRWA's mandate, made news internationally and was repeated in a variety of media sources. Not only does it inflate the severity of the humanitarian situation in Gaza and ignore its real causes, but it arguably helped inspire the so-called "Freedom Flotilla" launched later that month. A May 6 flotilla video from the "Free Gaza Movement"—which begins by citing Ging—provides prima facie documentation of this. On July 7, 2010, a British member of the European parliament, Chris Davies, sent a letter to the British foreign secretary in which he said that he had met with Ging, who had "confirmed the view that… Israel's blockade of the territory [Gaza] is profoundly counterproductive … Ging emphasized that although Israel was now allowing all foodstuffs through its checkpoints, it was not allowing anything for construction, commerce, and industry." Ging ignored the Israeli concern about letting into Gaza materials that would enable Hamas to build bunkers and storage areas for rockets or otherwise strengthen the organization's infrastructure. Also ignored was the Israeli government's announcement on June 20, 2010, of the loosening of restrictions and of plans to meet with international agencies to discuss advancing such projects as the construction of schools and hospitals. In fact, three months earlier in March 2010, U.N. secretary-general Ban Ki-moon announced that Israel would be launching a housing project in the Gaza Strip town of Khan Younis, which would involve the rebuilding of 150 housing units, a mill, an UNRWA school, and sewage infrastructure. This alone refutes the statement that Israel was not permitting construction. In mid-September Ging claimed that much of the water in Gaza was polluted and that 90 percent of it was not drinkable. What Ging neglects to acknowledge is that Israel continues to send water into Gaza even though there is no requirement to do so according to international law: Every year Israel provides five million cubic meters of water (each cubic meter equals 1,000 liters) to Gaza, transferred through three pipes—one in the center of the Gaza Strip and two in the southern part of the strip—in addition to the shipment of bottled mineral water via the Kerem Shalom crossing. As to water sources within Gaza, they are administered exclusively by the Palestinian water board with no Israeli interference. The entire water infrastructure (including water processing) that belonged to the Israeli communities in the Gaza Strip was left intact and ready for use when Israel disengaged from Gaza in 2005. At that time, Israeli and Palestinian officials toured the Israeli water processing facilities to ensure their proper operation. The Palestinians were given documentation to allow them to use the facilities the Israelis built to process sewage water for reuse in agriculture. Whether the facilities have been used efficiently is another question: It was noted at the time of the tour that chlorine that was being held by the Israelis for use in the water plant was not promptly claimed for use by the Palestinian Authority (PA). On September 13, 2010, Jerusalem allowed 250 tons of construction materials into the strip to upgrade a major sewage plant in Gaza City. On May 18, 2010, an Olympic-sized swimming pool was opened in Gaza. As recently as summer 2010, a "Crazy Water Aqua Fun Park," featuring three swimming pools, a canal 100 meters long, and ponds, was held in Gaza. Whatever water resources are available in the strip were sufficient for these projects and activities. I am delighted that the Elders come again to Gaza to witness and speak of simple and obvious truths that go untold. The truth that every one of the 800,000 children in Gaza knows is that we are in the fourth year of an illegal, inhumane, and counterproductive blockade on 1.5 million innocent civilians. Leaving aside Ging's cavalier use of figures to exaggerate the Gaza situation—four months earlier he spoke of 750,000, rather than 800,000 children allegedly "paying the toll" of the Israeli blockade—Israel has not been contravening international law and has actually exceeded its requirements with regard to the extent of humanitarian assistance permitted into Gaza. Moreover, while Ging uses the term "blockade" broadly, in actuality the only blockade is at sea as hundreds of trucks carrying humanitarian and commercial goods are allowed into Gaza weekly via land crossings from Israel. There's been no material change for the people on the ground here in terms of their status, the aid dependency, the absence of any recovery or reconstruction, no economy … The easing, as it was described, has been nothing more than a political easing of the pressure on Israel and Egypt. Yet three weeks later Ging rebutted his own claim by acknowledging that "the shops were full of consumer goods." Still in December, addressing a Gaza festival promoting a reduction in gender violence, Ging blamed Israel for the prevalence of this phenomenon by claiming that the "blockade" had devastated the economy and made daily life more difficult. Consequently, domestic violence had increased due to escalating levels of stress and unemployment. On December 27, Ging gave a talk at the Limmud Conference in Britain—an annual broad-based, Jewish community learning week featuring lectures and workshops. He acknowledged that matters were not dire—infant mortality figures, for example, were those of the first world; and while there were hungry children, "they're not emaciated." Yet he claimed that "we should not wait until they are emaciated" as the situation was deteriorating. But less than two minutes further into the talk, he contradicted the deterioration claim by saying that "we've now turned the corner … since the new Israeli government decision [June 2010] on adjusting the blockade, every day is better than yesterday." I need not tell you how difficult this period is for the Palestinian people. We are all painfully aware of the counterproductive policies collectively punishing the people of the Gaza Strip; conscious decisions that have caused untold suffering and a dramatic deterioration in the lives of the population, in contravention of international law. Like Ging, Grandi takes a highly politicized view of the Gaza situation, ignoring altogether its underlying causes—the years of continuous missile attacks on Israel's cities and villages—and misrepresenting both the nature and scope of the Israeli reaction and its legality. We are shocked by reports of killings and injuries of people on board boats carrying supplies for Gaza, apparently in international waters. We condemn the violence and call for it to stop … We wish to make clear that such tragedies are entirely avoidable if Israel heeds the repeated calls of the international community to end its counterproductive and unacceptable blockade of Gaza. It is terrible to say this, but I hope that the tragedy could be a turning point, a watershed in terms of the blockade. I hope that world leaders, those who make decisions, open their eyes to the suffering of the Palestinians. Frustration among refugees in Gaza has reached a bursting point with further unrest likely unless Israel lifts its blockade against them immediately. There is mounting disturbance among the refugees because they do not see their problems solved … this commotion will pose a risk to the peace process. In the fall of 2010, Grandi was still echoing the same themes. Calling for an end to Israel's "siege" of Gaza, he maintained that children enrolled in UNRWA schools would be studying in 186 shipping containers since Israel had not allowed the entry of one single truckload of construction materials requested by UNRWA. Riad school in Rafah, 32 truckloads. Eight classrooms being constructed in the Za'arah school, one truckload. Seven housing units in Khan Younis, nine truckloads. In the West Bank, there were signs of continuing economic growth. However, the context of occupation, human rights violations, and a variety of related factors conspired to deny many Palestinians and Palestine refugees the material benefits of economic revival. These factors included the construction of Israeli settlements on Palestinian land; the separation barrier; and the associated regime of movement restrictions … unacceptable and growing restrictions are replicated throughout the West Bank and are incompatible with the objective of Palestinian statehood as affirmed by the international community, and as embodied in the plan of the Palestinian Authority in that regard. Grandi's politicized statements regarding Palestinians who are not refugees and the objectives of Palestinian statehood as embodied in the PA plan, on the one hand, and regarding Israel's activities in the disputed territories, on the other, are well beyond the purview of UNRWA. The Israeli strategy is to make the international community talk about a bag of cement here, a project there. We need full unfettered access through all the crossings … Israel's blockade became a blockade against the U.N.
Masterful for its public relations effect, this statement is a blatant distortion of reality in that it pits Israel against the U.N., which wants school construction materials brought into Gaza, rather than against the strip's actual ruler—Hamas—which seeks to smuggle weapons to destroy Israel and building materials for weapons bunkers. Needless to say, Gunness fails to acknowledge Israel's legitimate need to prevent weapons or potential war materials targeting its civilian population from reaching Gaza. In referring to an Israeli strategy of making the international community talk about "a bag of cement here, a project there"—a phrase that caught on with the media—Gunness obscured the fact that Jerusalem had reasons for what was being done (which he surely knew) and created the false impression that it was being arbitrarily negative. UNRWA recognizes that the API [Arab Peace Initiative] is an important element in the pursuit of peace. The responsibility to ensure a negotiated end to the conflict lies with states and other political actors. That said, UNRWA is a stakeholder in the outcomes of any peace process. The agency is obligated to advocate for the realization and protection of the human rights of Palestine refugees … In keeping with UNRWA's mandate and its focus on promoting the well-being of refugees, the agency could serve as a facilitator and advisor to refugees, the United Nations and other entities engaged in formulating and implementing a future dispensation. Arlene Kushner serves as a consultant for the Center for Near East Policy Research, Jerusalem and drew this article from an investigative report she undertook for the center. "Hamas Is in Contact with Most Foreign Countries," The Jerusalem Post, Oct. 23, 2010. Daniel Pipes, "UNRWA Official Calls on Palestinians to Accept Reality," danielpipes.org, Oct. 23, 2010. "Assistance to Palestine Refugees," A/RES302 (IV), United Nations General Assembly, New York, Dec. 8, 1949. See, for example, Arlene Kushner, "UNRWA: A Hard Look at an Agency in Trouble," The Center for Near East Policy Research, Jerusalem, Sept. 2005; idem, "UNRWA: Its Role in Gaza," The Center for Near East Policy Research, Jerusalem, Aug. 2009. "UNRWA's John Ging and Children's Psychiatric Hospital in Gaza," YouTube, Jan. 4, 2010. See, for example, Jonathan Fighel, "Hamas in Gaza—Urban Warfare Strategy," International Institute for Counter-Terrorism, Interdisciplinary Center, Herzliya, Jan. 11, 2009; The Jerusalem Post, Mar. 15, 2010. Kushner, "UNRWA: Its Role in Gaza," pp. 10-2; author e-mail correspondence with Lt. Col. (ret.) Jonathan D. Halevi, spring 2009. "Guns n' teddy bears," Journey to Gaza: A Journalist's Diary Blog, Apr. 3, 2010. Kuwait News Agency, Apr. 22, 2010. "Hamas Covenant 1988," Yale Law School Avalon Project, accessed Mar. 30, 2011. Talk Radio News Service, Apr. 22, 2010. Kushner, "UNRWA: Its Role in Gaza"; The Jerusalem Post, Mar. 29, 2009. Aftenposten (Oslo), May 3, 2010. Al-Jazeerah: Cross-Cultural Understanding (Dalton, Ga.), June 15, 2010. "John Ging Gaza," YouTube, accessed Mar. 30, 2011; Aftenposten (Oslo), May 3, 2010. Islamic Republic News Agency (IRNA, Tehran), July 7, 2010. "The Civilian Policy towards the Gaza Strip: The Implementation of the Cabinet Decision (June 2010)," Coordinator for Government Activities in the Territories (CoGAT), Israel Ministry of Defense, Jerusalem. ShalomLife (Concord, Ont. ), Mar. 24, 2010. The Voice (Leuven, Belg. ), Sept. 20, 2010. Author e-mail correspondence with Guy Inbar, CoGAT, Jan. 3, 2011. Shlomo Dror, CoGAT, "Israel Turns over Gaza Water Processing Facility to Palestinians," Jewish Virtual Library, Nov. 21, 2005. "Construction Equipment to Upgrade Gaza Sewage Treatment Facilities," Israel Ministry of Foreign Affairs, Sept. 13, 2010. Ma'an News Agency (Bethlehem), May 18, 2010; Israel Matzav blog, May 25, 2010. "Crazy Water Park—Gaza," PhotoCamel.com, accessed Mar. 31, 2011. The park was closed by Hamas and subsequently burned down by vandals. "About the Elders," The Elders website, accessed Mar. 19, 2011. "Gaza: the Simple Truths that Go Untold," The Elders, Oct. 16, 2010. Ma'an News Agency, June 27, 2010. The Jerusalem Post, Aug. 27, 2010; Abraham Bell, "Is Israel Bound by International Law to Supply Utilities, Goods, and Services to Gaza?" Jerusalem Center for Public Affairs, Feb. 28, 2008. See, for example, "Gaza Strip—Land Crossing Activities: Crossing Status Weekly Report," CoGAT, Mar. 13-19, 2011. BBC News, Nov. 11, 2010. John Ging, UNRWA, U.N. press briefing, Nov. 30, 2010; idem, presentation, Limmud Conference of Jewish Learning, London, Dec. 27, 2010. "Gazans Rally Together at Festival to Combat Gender Violence," U.N. Women, New York, Dec. 9, 2010. Ging, Limmud Conference of Jewish Learning, Dec. 27, 2010. "Commissioner-General's Inaugural Letter to Staff," UNRWA, Jan. 26, 2010. Robert Serry and Filippo Grandi, joint statement, Office of the U.N. Special Coordinator for the Middle East Peace Process, Jerusalem, May 31, 2010. Ma'an News Agency, June 8, 2010. All Voices News (San Francisco), June 8, 2010; Stephen Lendman, "End the Gaza Siege," MWC News, June 15, 2010. The Daily News Egypt (Giza), July 2, 2010; Now Lebanon, July 2, 2010; Agence France-Presse, July 2, 2010. "Alternative Report Submitted to UN Committee on Economic, Social and Cultural Rights in Response to Israel's Third Periodic Report" (E/C.12/ISR/3), The Palestinian Centre for Human Rights, Gaza City, Oct. 18, 2010. "Humanitarian and Civilian Activities vis-à-vis the Gaza Strip – Monthly Report, October 2010," CoGAT, Nov. 10, 2010. "Commissioner-general's Statement on the UNRWA Advisory Committee Meeting," Mövenpick Hotel, Dead Sea, Jordan, Nov. 30, 2010. BBC World Service, June 18, 2010; Ma'an News Agency, June 18, 2010. Ma'an News Agency, Dec. 16, 2010. Related Topics: Arab-Israel conflict & diplomacy, Palestinians | Arlene Kushner | Summer 2011 MEQ receive the latest by email: subscribe to the free mef mailing list This text may be reposted or forwarded so long as it is presented as an integral whole with complete and accurate information provided about its author, date, place of publication, and original URL.